This award-winning documentary explores the lives of Sikh youth in America, and how they confront and respond to violence, sometimes with humor. In May 2017, two men were convicted of a hate crime for attacking Richmond resident Maan Singh Khalsa the previous September. Before they attacked Khalsa, they threatened to cut off his hair. As a follower of the Sikh faith, Khalsa doesn’t cut his hair, and like many Sikhs, he ties a turban. Sikhs have often been victims of hate crimes since 9/11, but they’ve actually faced violence since they set foot on U.S. soil a century ago. Today, in the Bay Area, the voices of young Sikh-Americans still tell stories of violence and trauma, but they also tell stories of healing and resistance. Growing up as a Sikh in the Bay Area, I always felt part of a silent community. We are pointed at, stared at, whispered about, yelled at, beaten up, shot at, and sometimes killed. The one thing we almost never are is listened to. I want to unmute myself and my community. My dad often tells me that Sikhs are like potatoes. Potatoes can grow anywhere. They are resilient. So I asked the Sikhs around me: how do we survive in America? I want to share stories of resilience in the Sikh community so, at last, we can hear ourselves speak. Raaginder Singh was in elementary school when he told his parents he wanted to play the trumpet. They pointed him to the violin, instead. For them, the violin represented prestige. 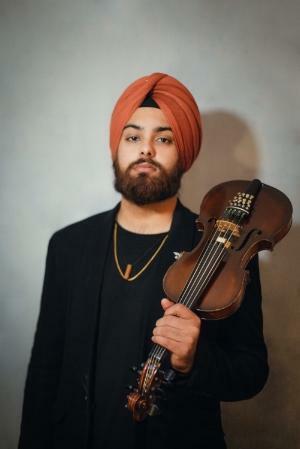 Now, Singh is an accomplished violinist and composer who goes by the stage name Violinder, but when he first came to the US, he was a turban-wearing Sikh immigrant kid with an accent, going to school in Hayward. He didn’t care about prestige, he just needed to make it through the fifth grade. On the first day of school, Singh walked into class, a new kid wearing a turban. All eyes were on him. Then, a month later, 9/11 happened. Singh remembers people going out of their way to tell him, “Go back where you came from.” The students, the parents, and the other adults made it clear that he was not welcome. The feeling of being empowered that Singh has now, as an adult, is rare for many Sikh children in America. Almost 70% of Sikh children who wear turbans get bullied in school. But when did the violence against Sikh-Americans begin? The early Sikh immigrants harvested crops, chopped wood, and built railroads. They worked for lower wages than white workers, and racial tensions climbed and then erupted. In 1907 in Bellingham, Washington, a mob of angry white workers attacked hundreds of Sikhs. Soon after, the US passed a law that banned Asians from entering the country. In 1965, that all changed. After 1965, Sikh immigrants came to America in waves from their homeland. When the British colonized South Asia, they left a border in their wake. Like a great gash across the land, it split the Punjab region in half. West Punjab became Muslim Pakistan and East Punjab became Hindu India. That left Sikhs stuck in between. My grandparent’s generation fled across the Pakistan-India border to build a new life in a new nation. Most of their children grew up during the 1980’s in India, when a movement for Sikh independence took hold. The Indian military and police shot thousands of Sikhs dead. The economy of Punjab was destroyed. So my parent’s generation became a second generation of immigrants, seeking refuge in a place called “Amreeka.” That’s where I was born. My generation began life in a country that had once conspired against our being here at all. We were the third generation forced to learn resilience, like potatoes growing in infertile soil. When Sikhs came to America from Punjab, they brought the language with them. Today, youth are organizing to keep Punjabi alive in America. Sikh youth volunteer with the Jakara Movement, registering voters in Sikh temples across California. Credit Courtesy of Ramandeep Kaur. Kaur is the Bay Area community organizer for the Jakara movement, which works to empower Sikh youth. One issue they’re addressing is the growing fear in the Sikh community that the Punjabi language is dying. Jakara organizes Sikh youth to advocate for Punjabi classes in their high schools. In Bakersfield, a group of high school students wanted Punjabi to be taught in their high school. So, they started a petition and collected 1500 signatures in one day. “Having Punjabi as a language, it’ll help the students here, today, who are raised in America, to see [their] language is important,” says Kaur. Jakara also uses language to build political power. 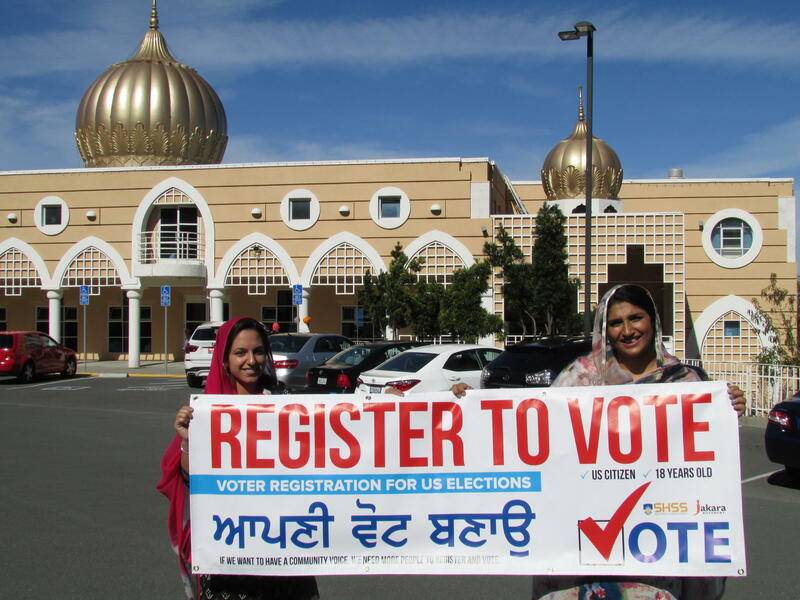 Last year, they registered 3000 Punjabi voters in Sikh temples across California. According to Kaur, as they were registering voters, people were concerned about whether ballots would be available in Punjabi and whether they would be able to understand what was written in them. Voting materials aren’t actually available in Punjabi because there’s no official record of how many Punjabi-speakers are in the U.S. This year, Jakara launched a campaign to change that. As young Sikhs in America, we find ourselves translating Punjabi into English and English into Punjabi all the time. We aren’t just translating words, but ideas, beliefs, and traditions. We’re transitioning between worlds. We’re acting as code switchers, like Jupp Gill. Gill shaves his head so he’s bald, but sometimes he ties a turban. This is unusual because most Sikhs who tie turbans have long hair underneath. It means Gill can switch identities with ease. “I live between two worlds. It’s weird,” he says. It’s definitely tricky, living in that sliver of space between Punjab and America. Even today, despite the intensity of pat-downs and airport security, Gill doesn’t respond with aggression to being racially profiled. He believes if he did, he would only get twice as much violence or aggression in return. Gill is a yoga teacher from Fremont. He says he has often experienced the direct impact of Islamophobia in his life. Once, as a college student at UC Irvine, he was performing a Punjabi folk dance called Bhangra, with his teammates. They were dressed in traditional, authentic Bhangra outfits and had just finished an 8-minute routine, when they exited the venue for some fresh air. A group of men who had been drinking in a restaurant next door began yelling racial slurs at them, calling them “ragheads,” “towelheads,” and “camel jockeys.” A fight started and Gill says he was kicked in the face. One of the men grabbed his teammate’s turban and ripped it off. Gill grew up keeping his hair uncut. Once, when he was about five or six, he was on a trip to India with his dad. While his dad was in the bathroom, Gill decided to cut his hair. Gill remembers that when his dad got out of the bathroom and saw what Gill had done, he grabbed a wooden chair and threw it. It broke. Soon after, Gill decided to stop cutting his hair. He let it grow and began to tie a turban. In high school, he was proud of the fact that he had a turban and long beard. Eventually, he began to lose hair. Because he was balding, he decided to cut it again. 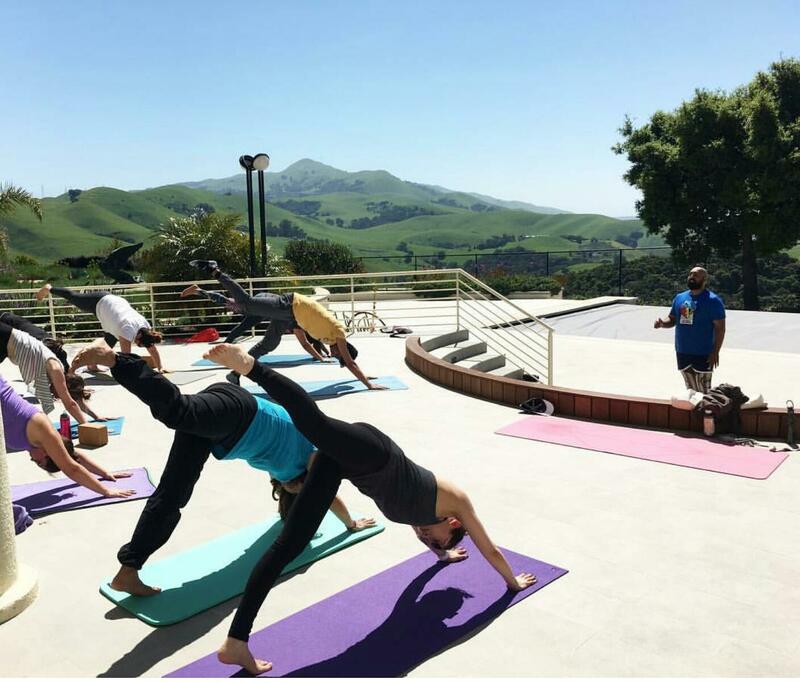 Sikh Yoga teacher, Jupp Gill, teaching at his home in Fremont. Now, Gill does wear a turban sometimes —which he commands attention. He believes that when you wear a turban, you represent the entire Sikh community, and that determines how you should behave. Growing up, I did not tie a turban. I used to have a long braid that other kids pulled relentlessly. Not many Sikh women wear turbans, or dastaars, but after I graduated from high school, I decided that I would. I, too, wanted to represent my community. I wanted to feel the presence of a divine spirit, to wrap the stories and sacrifices of my ancestors around my head each day before I went out into the world. I no longer wanted to inhabit an individual body, but a communal one. I wanted my ancestors by my side at every moment. I wanted to be something more than a person. I wanted to be a symbol. Long ago in Punjab, before the birth of the Sikh spiritual tradition, only kings wore turbans. Then came the Sikh spiritual teachers, or gurus. In 1699, the 10th Sikh guru created a new and distinct community, where all were royal, where all could wear dastaars, or turbans, regardless of caste, class, or color. A community that would act collectively as a sword, striking at the heart of oppression and injustice. And so Sikhs, like the United States, were born from revolution. The Sikh tradition of fighting injustice is exemplified by Gatka, a martial art. Gatka players use swords, wooden sticks, nets, and shields in a style of mock combat training. They wear long blue robes called Cholas. Gatka players are traditionally men, but some, like Pooja Kaur, are women. As a woman playing gatka, Kaur is upending tradition while preserving it, resisting oppression as a woman, and as a warrior. Kaur is 19 years old and a student at Chabot College. She started learning Gatka when she was about 10. At that time, she was one of three or four girls who learned it. While playing Gatka, Kaur wears a Chola, a long blue robe with buttons. In school, Kaur says she often felt like a foreigner, but Gatka practice always felt like home. There were times in school when she would be bullied for wearing a turban. In eighth grade, she says, a classmate of hers kept trying to touch her turban and repeatedly called her “Gandhi” behind her back. When she told him to stop, he wouldn’t. So she turned around and backhanded him in the face. After that, she says he never looked her in the eye again. Now, when she feels alone, Kaur remembers that she comes from a long line of Sikh warriors, that she’s a part of Sikh history. “Sikhs are known to be a minority for so long—always fighting, never stopping the fight against injustice,” she says. There is a hymn in Sikh scripture, written by the 15th century mystic poet Bhagat Ravidass. It describes the discovery of a place called Begampura. Begampura is a place without sorrow or suffering, where all are able to worship as they choose, where all are equal and content and free. It isn’t necessarily a real place, it’s more like a state of mind. Striving for Begampura, both in the material world and in the mind’s world, is what it means to me to be a young Sikh-American today. That’s what these stories of Sikh-American youth are about. Begampura is what the United States of America should be, what it is supposed to be: hostile to none, home to all. "I ain’t here for no reason" was awarded the prize for Best Audio Analysis by the Society of Professional Journalists of Northern California.